I recently had the honor of winning a copy of The Nutcracker and the Mouse King by E.T.A. Hoffmann, illustrated by Gail de Marcken, from Buried With Children. The book is technically a children's book, but I have to admit that I sat down and read it by myself ... and I loved it. I've seen the Nutcracker ballet, and read books based on the ballet. But I have never read the full story as it was originally written by E.T.A. Hoffmann in the 19th century. The story is much more complex than the ballet. We learn the background of the Mouse King, and we discover how the Nutcracker came to be a nutcracker. I thought all of this was quite fascinating. The language is lovely and the illustrations are beautiful. I enjoyed it enough that I plan to read this again, and will likely read it each holiday season. I don't necessarily think this is a great book for young children, though. It will likely be another year or two before I try reading it to my kids. There is a great deal of text on each page, and the storyline is a bit complex for younger kids. There are also a couple parts of the storyline that I think would frighten my children. 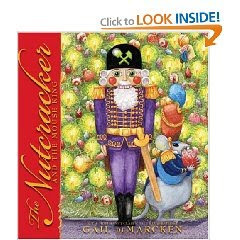 I think The Nutcracker by Susan Jeffers, which I read to C a few weeks ago, is much more appropriate for younger kids, since it's light on text and not as complex of a storyline. But The Nutcracker and the Mouse King is a beautiful book for adults or older children. This review was written based on a copy of The Nutcracker and the Mouse King that I won through this giveaway.